Today, it seems that true Leaders are in short supply. Just look around. Ask yourself, who are our leader’s, hero’s and role models today? Leadership is sorely needed in every aspect of our lives. The questions are, what is leadership and why would you want to be a leader? -Looked around and felt that things were just not quite right? Are you disgusted with what you see happening to our society? -Felt that there is a leader hidden deep inside of you, but you just can’t break free from those last few obstacles? -Been able to create some positive change, only to return to your old habits? -Felt frustrated because, even when you change yourself, you can’t help your loved ones with the same challenges? -Wondered why you aren’t doing greater things with your life? -Found yourself struggling in life and can’t seem to ever get ahead, whether it be financially or otherwise? Leadership is about having a vision bigger than yourself, bigger than this moment. Leadership is about making your vision a reality. A true leader is someone who inspires others to become who they truly are. True leaders are selfless, persuasive and committed to creating lasting positive change in those around them, in every aspect of modern life—whether it’s at work, in public office, in school or as a parent. 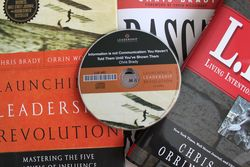 We are dedicated to providing world-class leadership materials to business executives, entrepreneurs, corporate climbers, church leaders, administrators, community service leaders, public servants, teachers, parents, and anybody who will find themselves in a position to lead. When it gets right down to it, leadership is for everyone. Nobody will be able to make their way through life without needing to draw upon the toolbox of leadership. Sadly, many people lack these tools and therefore get to live with the consequences of being ill-equipped. These consequences include missed opportunities, unfulfilled career aspirations, financial woes, and broken relationships. The Leadership and personal development education we offer is for those who earnestly seek a better life, are interested in the process of personal growth, are driven to succeed in significant ways, and are committed to a life of excellence for a higher purpose. Ultimately, we are combining the education and training from LIFE, with the knowledge, experience and expertise of leadership practices utilized in today’s modern aircraft cockpit. With this unique approach to teaching leadership, the sky’s the limit. Destination success awaits. Be the best you can possibly be and live the life you’ve always wanted.